I know which one I am but others are a bit hazy, has anyone got any ideas? This page was added on 07/03/2012. After seeing some of the photos on this site there are student faces I do remember from the time at Clarendon School. I was also in the band that traveled to Germany. Part of a group known as Bond, Pond, Hosgood and co. I have spent most of my life living in Australia. I think that you Clive and myself were in close vicinity. Of course, the altercation with DB was blown out of all proportion by us junior kids (I was only nine at the time!). I guess ye both must have been at Clarendon in the 1953-58 period. Your location in Perth, Western Australia, should not be a problem, as he (D Reidy) has been sending his earlier book on SO, “Poor but Proud”, all over the globe! I spent ten days in Perth a couple of years ago, staying in Sullivan’s Hotel, next to King’s Park, during which I looked up an old pal, Terry Collyer ex-Puttenham Close and Clarendon 1960-65, who’s the younger brother of Frank Collyer, former Watford GS, Cambridge Univ. and Herts CC cricketer/captain. Terry used to live in Freo, but has since moved over to NSW. Small world, ain’t it? Finally, the only photo I’ve seen of your gang was the whole school pic taken in June ’57, which has since been removed for copyright reasons. In the meantime, keep looking! Kind regards, John. Hi John, I can remember a small altercation with Dave Brimmicombe at the front of Little Furze and we were both talked to by a teacher after. It appears some Chinese whispers made it more than it was. Later in our teens I saw Dave a few times and we played a few rounds of golf together. I will contact Dave Reidy about obtaining book on Oxhey although I am in Perth West Australia. There was a picture of our class including Clive, Brian and I of course but it appears to have disappeared off this site, hopefully it will return or maybe I just can not find it. Hi Terry. Great to hear from you after a lapse of 62 years!! I apologise for the mistaken identity, which partly is the result of trying to spot you on the 1957 Clarendon School photo, with prompting from one of your old pals, Brian Lawrie. I remember you as a dark-haired, strongly-built lad with a passion for sport. I kept a record of all the cricket matches I played from June 1953 until I retired from competitive league cricket in September 1982, and I’m convinced that you played in at least one of the five games at Little Furze indicated above, under the guidance of my form teacher in 1953, Leo Magin (tall with gold-rimmed specs!). If I may recall another one of your achievements at primary school, again in Coronation Year, it was the epic encounter with a large lad called Brimmicombe!! After that, you became something of a folk hero with the younger lads, both in Hayling Road and Little Furze, so there! As Brian fondly recalled in a recent memo on Facebook, it was not a good idea to annoy Terry! Finally, I hope ye will consider buying a copy of David Reidy’s book on Clarendon, which is in the process of being compiled in anticipation of publication sometime next year. Perhaps you have already seen my entry on this website concerning the new title? I hope ye are fit and well. All good wishes, John Swain S.O. Hayling Road resident 1953-65; Little Furze Junior School 1953-54; Watford GS 1954-61; University of Bristol 1962-66. I taught at Clarendon on an uncertificated/ supply basis from 1962-66. I currently live in Bishop Auckland, County Durham, as a widowed divorcee ( two grown-up children and three grandchildren), but I still keep in touch with links in the SO/Watford area, including the ouroxhey website. Sorry John that is not me in the photo and I do not remember playing cricket at Little Furze although I am sure if there was a game I would have played as I enjoyed all sports, especially football. I went to Mainz with the school band but can not remember year.Nice that you remembered my name. 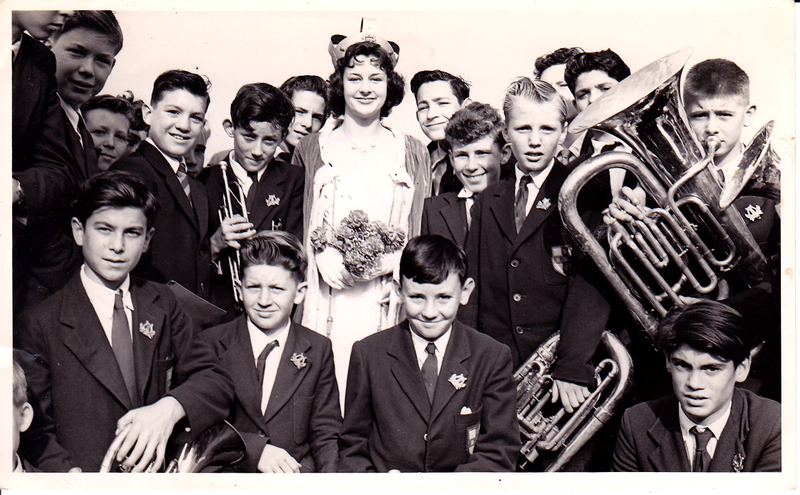 One or two of these lads are familiar to me, but can anyone confirm that the big chap in the bottom right is Terry Bramley, whom I recall with great pleasure at Little Furze Junior School in 1953? Although two years my senior, we played in the School cricket team in June/July 1953, the first-ever side to represent the new school in the summer game. I was captain in the following year before heading off to Watford GS for Boys in September 1954. Incidentally, prolific author, David Reidy is planning another book on South Oxhey, this time a history of Clarendon School, so I hope that some of you will come forward with more of those happy memories of a fine school. To the left of the lady is Robert Penn, next to him is Terry Welch. Behind Robert is Francis Noseda.Right of the lady is Alan Heyway next to him is Alan Catlin. Behind ALAN Heyway is Laurence Elborn. Behind ALAN Catlin is Peter Pond.Next to me is John Boswell.Next to Tony Town is ALAN Clark.Behind Terry Welch is Tommy Hill. What a wonderful find this is. I was in the band with Tony Town. We formed a skiffle group and played at a few local venues. It would be great to hear from anyone who remembers me and can tell me, what become of Tony. Look forward to hearing from you. My name now is Peter Wise, long story. Thank you Eddie, glad someone remembers me, were we in the class? Eddie Porter I remember you from school. You used to carry my school books home for me. Got a class photo with you in it. How are you? Are you on Facebook or friends reunited? Would like to hear how you are. Good memories of Clarendon. What a surprise to see old (Young) friends after so many years. Bottom left is Tony Town, above to left is Terry Welch and at the mouth of the E Flat is Peter Pond. Others I remember by face only. Roger Elliot was a great tutor and gave me a boost in confidence that I needed at that age. I played Trumpet and travelled to Germany twice with the Band. Great memories. I also remember going back to Clarendon to attend Roger’s Funneral. Very sad. The lad on the left next to the May Queen I think is a young Tony White. Yes I do remember Barbara Birch along with Jacui Westwood and her brother. Linda Coombes, Linda Gray, the Osbourne twins (one lives on the Carpenders Park side). I am still on the estate and will stay on the estate. My brother Philip found this site,this is absolutely amazing so glad people keep photos and information, I know all the names mentioned, think one of the boys is Ian Mckinnon, had a bit of a crush on him. I have very fond memories of school life first at Little Furze then Clarendon, would love to hear from any one who remembers me. Is the fair haired boy next to John Boswell , Alan Catlin?